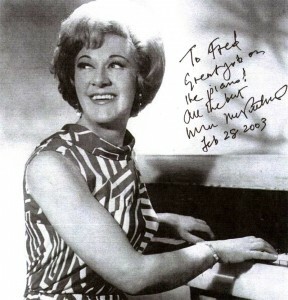 I went to Marian’s home in Long Island to film her for THE GIRLS IN THE BAND. From the moment I stepped in the door I knew that I was in the presence of a consummate professional. Marian was completely prepared for our interview, dressed perfectly for her “on-camera” appearance and even had her own make-up artist in attendance. A grand piano dominated the living room and there was no doubt as to where the interview would take place. Various piles of music sat on the piano and it was easy to imagine that as soon as we left Marian would be going right back to work in preparation for her next gig. She was approaching ninety years of age and had no intention of slowing down. Sometimes when interviewing a musician, it takes a while to get the verbal pump going…not with Marian. From the first question to the last, the words and ideas flowed like music. And every story came to a point and resolved. All I could think of was “Oh, my editor is going to love this!” And so he did. From the time that Marian appears in the documentary until the final frame, she is a driving force, sharing fascinating stories of her life and salting her conversation with colorful musician-epithets delivered in a proper British accent. The juxtaposition of what she says and how she says it are part of her unique personality, which like her music, knows no boundaries. In 2008, Marian appeared in our remake of the Art Kane photo which features all women jazz musicians (and three men). She is the only musician to appear in both photos. 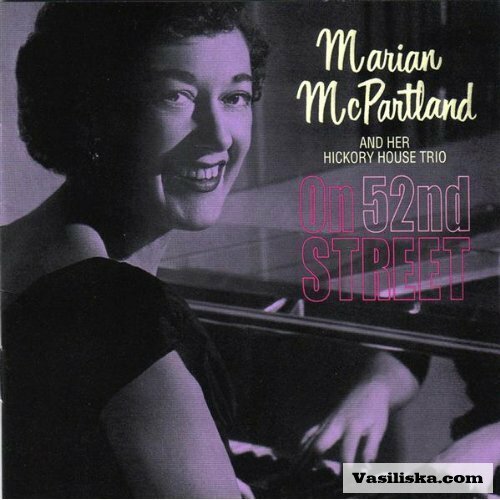 Marian can still be heard on NPR and online and on live gigs…Long live Marian McPartland.